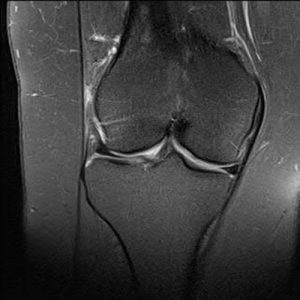 The patient, a 43-year-old female, presented to the office with right knee pain. Approximately 8 years prior, the patient was involved in a motor vehicle accident in which she sustained a knee vs dashboard injury. Although the patient was able to walk away from the accident, she had residual knee pain. 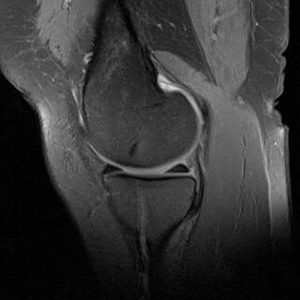 The patient was examined by another physician, who ordered an MRI study to determine pathology in the knee. The MRI findings showed potential fraying and degeneration of the lateral meniscus, but the findings were not conclusive. The patient was diagnosed with a knee contusion and received a corticosteroid injection and physical therapy to treat the knee pain. Physical therapy continued on and off for 2 years, but the patient knee pain remained unresolved. The patient continued to have swelling in the knee, and pain along he joint lines and around her patella. The patient was subsequently examined by another physician, who ordered a new MRI. The MRI findings returned with inconclusive pathology to explain the patient’s knee pain. Patient was instructed to take anti-inflammatory medication (NSAIDs) and apply a topical analgesic to the knee when pain surfaced. Patient presented in the office eight years after her accident, with unresolved right knee pain, following examination by multiple physicians and multiple prior MRI studies. X-rays showed no signs of joint space narrowing, and no obvious bony pathology. 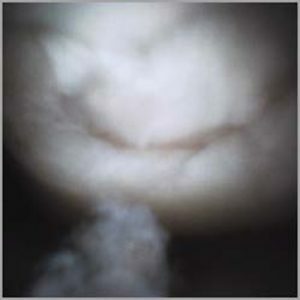 Physical exam showed a mild effusion with diffuse pain. An articular cartilage 3T MRI was ordered and was read by a musculoskeletal radiologist. The MRI showed potential Grade II arthritic changes in the patellofemoral compartment and medial compartment and possible fraying of the lateral meniscus, but the findings were not conclusive. The patient was again prescribed physical therapy, anti-inflammatory medication and received a corticosteroid injection. Patient’s pain continued with treatment and a diagnostic arthroscopy was scheduled to take a look at the patient’s right knee. Prior to the planned diagnostic arthroscopy, the patient agreed to have an in-office arthroscopy utilizing the mi-eye 2™ device. The patient was positioned in a reclined position on the examination table with her right knee flexed to 90 degrees. The patient’s knee was prepped with a topical iodine solution and patient was injected with 20cc 0.2% Lidocaine without epinephrine in the portals and joint to numb the area for the procedure. The mi-eye 2™ was inserted into the lateral and medial portals of the right knee for examination. 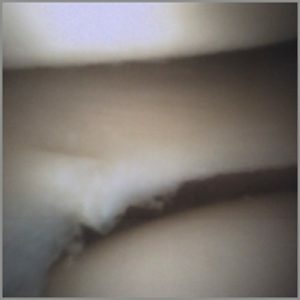 Upon entering the intra-articular space, the mi-eye 2™ visualized lateral pathology including a 10mm x 10mm Grade IV chondral defect in the Lateral femoral condyle and fraying of the anterior horn of the lateral meniscus. Further examination showed a 15mm x 15mm Grade IV chondral lesion of the medial femoral condyle and Grade III/IV fissuring degeneration of the lateral facet of the patella. Following the procedure, the mi-eye 2™ was removed from the joint and patient was treated with a bandage to cover portal location. Through the entire procedure the patient was able to see the images of her knee and understand the pathology that was being visualized by the physician. The patient had previously received a total of 4 MRIs over an 8 year span that did not show the pathology that was visualized by mi-eye 2™. In addition, the patient had required multiple visits and been examined by multiple physicians prior to ultimate diagnosis of her knee pain. If direct visualization was utilized in the 8 years prior to the eventual diagnosis, a wider array of articular cartilage treatment options would have been present. At this time, the patient is weighing her options on how to treat her chondral lesions in her right knee. The mi-eye 2™ offered the closure to the patient as to what was causing her knee pain, while saving the patient an unnecessary trip to the operating room for a diagnostic arthroscopy. Rather, the diagnostic arthroscopy was performed in the physician’s office and the patient was able to leave the same day with an answer. Arthroscopy remains the gold standard for definitive diagnosis of intra-articular pathology and mi-eye 2™ allows for that arthroscopy to occur without the need for surgery.